My novel What Empty Things Are These is set in 1860. What could their dress say about the status of women in 1860? Well, that may be obvious – but what does it say about a particular kind of chaos in the minds of Victorians? Perhaps more than you might think. Presumably, if you’ve been attracted to the title of this blog, you’ll already know something about corsets and crinolines. Well, 1860 was about the time when the well-dressed Victorian woman achieved a perfect bell … but more than that, she achieved the physical expression of total contradiction. Or should I say, it was achieved for her. There she was, cinched-in at the waist and sumptuous above and below. A caricature of sexuality – that hourglass figure – and yet covered from neck to toe. And when she went out, she topped it all off with a bonnet and possibly a veil, and carefully-buttoned gloves. I would say, personally, that we read into this a society excruciatingly at odds with itself about women’s sexuality. Certainly, the middle class was, anyway. Witness all the limitations on a woman’s behaviour if she was to prove her worth as some kind of human being. The patriarchy strongly suspected she was a sexual being, which was apparently a bad thing and a bit of a threat, and the onus was on her to prove that she wasn’t … while declaring she actually was, through the very dress that she wore. I say a lot more about this in my Master’s thesis (see the ‘Thesis’ section on this website), but here I’m just introducing readers to the notion that cultures give out tell-tale signs of themselves in things like, for example, dress. 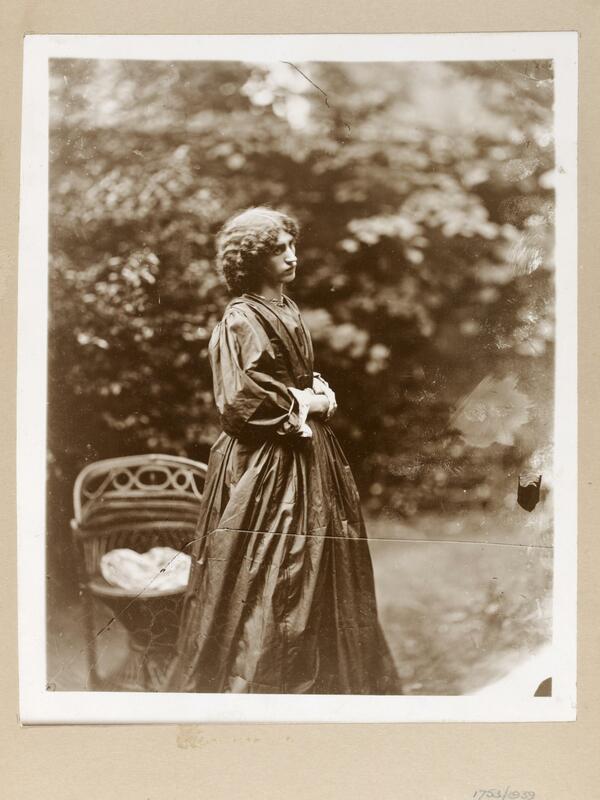 The Pre-Raphaelites’ favourite’s model, Jane Burden. Pic from the Victoria and Albert Museum. 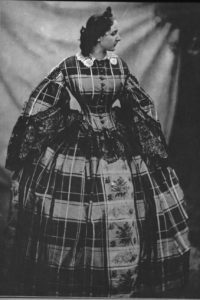 Of course, in the 1860s there was also the emergence, in a small but significant way, of ‘rational’ or ‘aesthetic’ dress. This eschewed corsets and crinolines … but don’t get too excited. While there were some who had begun the discussion in some way about women’s rights (Barbara Bodichon and John Stuart Mill, for example, and arguably a small host of novelists), the intellectual and very political rationale behind ‘rational’ dress was one of contempt for the showy, conspicuous wealth of the wealthy industrial class. There wasn’t much in that discussion (see Ruskin, especially) about women’s lot, really, about being paraded about as trussed-up sexual parcels. Incidentally, the sumptuousness implied in a truly showy bell-shaped construction was at least in part a bit of a swiz brought about by new technology. 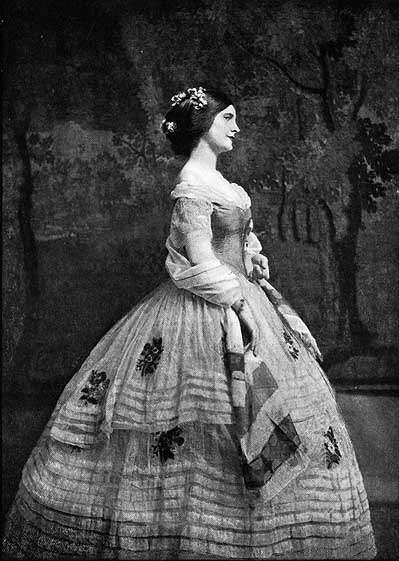 By 1860, crinolines were much lighter and stronger than theretofore (being made of wire rather than bent wood and horsehair), and that meant that while several layers of petticoat were implied, in fact you could get away with one or two. Suddenly you could look impressive without dragging around kilos of extra, dragging weight – a testament to new technology. Would have made life a lot easier were it not that now the whole construction was so light it could easily tip up in the wind. This not only provided readers of the satirical magazine Punch with much cartoon-based entertainment, but also somewhat hastened the development of sturdy and modesty-protecting underwear. Also, while corsets at this stage certainly looked very constricting (and in many cases probably were), the size of the skirts actually served to emphasise the ‘smallness’ of the waist. You could get away with a tug or two less on the strings. In many cases, corsets were just snug – though you couldn’t be seen without one. Why, you might be a Pre-Raphaelite’s paramour! Real constriction came in with the bustle a few decades later. Or to be precise, after the more massive version of the 80s had finished with otying with women’s poster, and the smaller version of the 90s brought attention back to waists. Perhaps the size these somehow need to be had something to do with the more money there is sloshing about amongst the wealthy, the greater the contortions women have to go through to prove how well-off their family is? Perhaps. I’ll think about that one. Incidentally, back in 1860 Adelaide and Sobriety experienced some difficulty with the wind on Hampstead Heath. See above for the feared effects of a crinoline in a high wind. You’ll have to read my novel What Empty Things Are These to find out more!